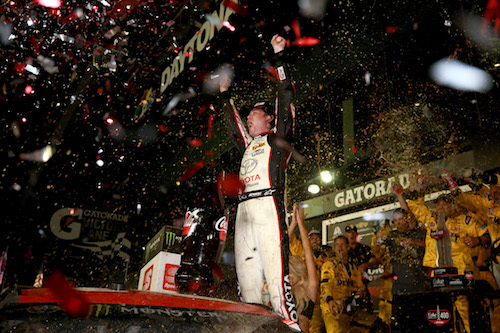 Erik Jones led only one lap of the Coke Zero Sugar 400 at Daytona (Fla.) International Speedway on Saturday night, a race that was scheduled for 160 laps but extended to 168 by two overtime restart attempts. But that one lap was enough to garner the Joe Gibbs Racing second-year driver his first-career Monster Energy NASCAR Cup Series win. Toyota finished one-two, with reigning Cup Series champion Martin Truex Jr. taking runner-up honors, despite suffering crash damage earlier in the race. Both JTG-Daugherty Racing entries were in the top-five at the checkered flag, with A.J. Allmendinger finishing third and his teammate, Chris Buescher, in fifth. The other top-five finisher was Kasey Kahne in fourth. In the race that saw 10 cautions and multiple large crashes, more than half of the 40-car race field was involved in at least one multi-car crash. Ricky Stenhouse Jr., who led a race-high 51 laps and won both 40-lap stages was blamed for multiple crashes. The first stage ran caution-free and had only two race leaders, Chase Elliott and Stenhouse, with Stenhouse leading the final 29 laps of the stage. His win of the first stage was his first-career stage win and the first, ever, for Roush Fenway Racing. Early in the second stage, though, the race became somewhat of a wreck-fest. Stenhouse retired from the race as a result of a crash with Kyle Larson on lap 123. Finishing sixth through 10th were Ty Dillon, Matt DiBenedetto, Ryan Newman, Austin Dillon and pole sitter Alex Bowman.